You know this photo was taken for promotional purposes, because none of the men has a reeking cigar clenched between his teeth. Texas Electric Railway Interurban ad reprinted in Texas Historian, Jan. 1981. Interurbans were great. I wish we still had them. Read about what they were, here. 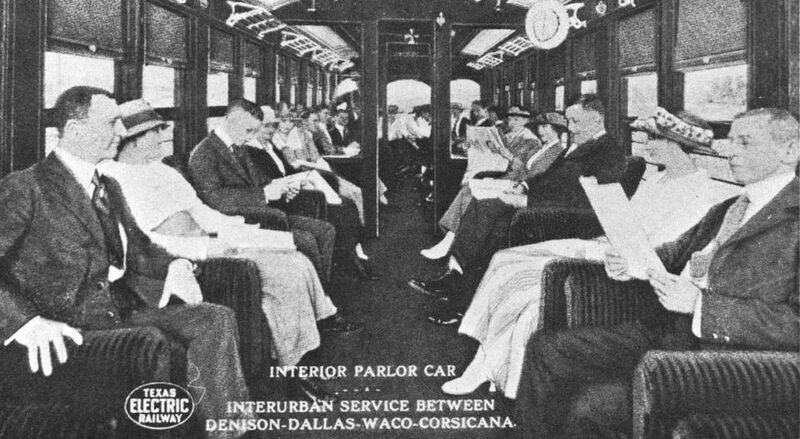 If the TE cars were anything like Fort Worth’s Crimson Limited Interurban Cars, then the front section is non-smoking. You would need to pass through the door seen just past the 5th chair where you would see spittoons on the floor and smokers sitting in wicker chairs. Match strike plats were mounted on the carlines between the windows. Smoking was prohibited on the local streetcars. How interesting! Thanks, Andy. As much as I love imagining life in the past, I’m thankful spittoons are no longer part of everyday life!